The combined alluvial plain created by the Lanyang River and many minor streams is roughly in the shape of an equilateral triangle. The three vertices are Toucheng, Sanxing, and Su'ao, with an equal distance of 30km on three sides. The Xueshan Mountain Range sits to the northwest of the line from Toucheng to Sanxing. Geologically it is the divide between the cliffs and the plains. The Central Mountain Range sits to the south of the line from Sanxing to Su'ao. Many small streams flowing out of the valleys make the piedmont lines uneven. The line from Toucheng to Su'ao is the coastline and curves gently inland. This is where the Lanyang River flows into the Pacific Ocean between the East Harbor at Zhuangwei Village and Qingshui of Wujie Village. With abundant water resources at their disposal, the residents of Yilan live their lives mainly on the fertile Lanyang Plain. The Upper Lanyang River is steep and the rapid current is highly erosive. Large amounts of silt carried by the river have little time to settle since the land suddenly drops away as it flows out of the mountains and valleys. An alluvial fan is formed as a result of scattered sand and gravel settling down. Large amounts of gravel accumulate in the shallow river bed, creating an alluvial fan that often forms into a web-like pattern. The river tends to change courses after floods caused by heavy rainfall or river overflow. The water system is tangled beyond recognition and river capture and stream piracy remain common phenomena. All of the above are characteristic of the flood plains. 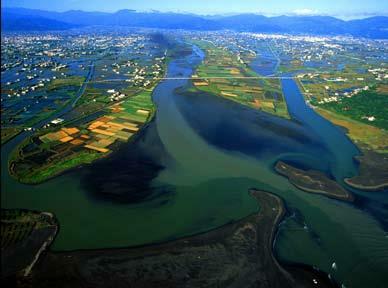 The Lanyang River slows down as it reaches mid- and downstream where silt begins to settle. After years of deposition, the roughly equilateral triangle shaped Lanyang Plain slowly formed. Now the land is wide and flat and cities have sprung up with people living closer together and more convenient transportation. It is the most developed area in Yilan.